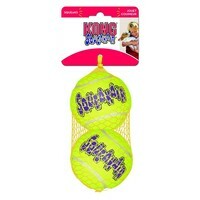 Air Kong Large Squeaker Tennis Balls come in a pack of 2. These durable, high quality Squeaker tennis balls are covered in a non abrasive tennis ball material that will not wear down dog's teeth. Each ball is approximately 3.5 inches across. I wouldn't call these durable as my galgo destroyed them in a matter of minutes. Not recommended. Got my labrador these, have ordered them twice before. Usually destroys any toy within 15 mins but these last months and months, best toys ever!!! and she loves them, won't buy any other toys apart from these! also best website to buy from, so cheap compared to other pet stores and a great service! highly recommend these for any dog! I'm a big fan of these. I have a staffordshire bull terrier who LOVES to play fetch but normal sized tennis balls, once they're covered in saliva, can easily slip down his throat due to his wide mouth & pose a real choking hazard. These balls are large enough to mean I don't need to worry, they're very durable and best of all the SQUEAK. He LOVES them, and I'm pretty taken with them too.